The anti-riot helmet unrivalled in its class. 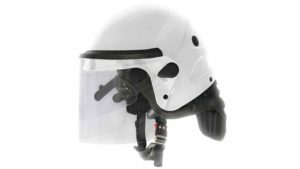 A long process of in-depth research and testing has led to the huge success of the new DH20 Helmet, designed to protect the safety of those responsible for maintaining public order. Our in-house Research & Development Lab has succeeded in further increasing the semi-ballistic performance level of this model, made of multiple layers of Kevlar to achieve a fragmentation resistance of 300m/s in compliance with STANAG 2920. Featuring high semi-ballistic resistance, also against stab penetration and chemical aggression, the DH20 Anti-Riot Helmet has been hugely successful even beyond national borders: it is in fact already the helmet of choice for many European countries. The special shock-proof inner shell is made of different density EPS and lined with a hypoallergenic, breathable, antibacterial, flame-retardant, removable and washable fabric. The visor in Lexan Polycarbonate is 4 mm thick, scratch-proof and fog-proof, with anti-drip upper edge and protective nape flap in a fireproof material. Weighing just 1800 g, the DH20 Helmet is available in various sizes from XS to XL in a range of different colours. National Institute of Justice U.S. STANDARD FOR ANTIRIOT HELMETS. The impact puncture resistance capacity is tested according to the Fragmentation Resistance V50 test as per Stanag 2920 NIJ Standard -0104.02 and 2 ballistic 22 caliber fsp tests, and ballistic test with 17 grain T37 projectiles. The helmet is resistant to a velocity of 300 m/s. The flame resistance capacity is tested as per Standard EN 443. The 4 mm thick visor complies with standard EN166 class 2 and has a ballistic fragmentation resistance of V50 at 250 m/s in compliance with Stanag 2920 NIJ Standard -0104.02.